I tried to make this image unique from a standard bouquet toss photo. As a wedding photographer I tend to find myself making photos that are similar in nature every weekend. I am always striving to see wedding traditions in a different way. 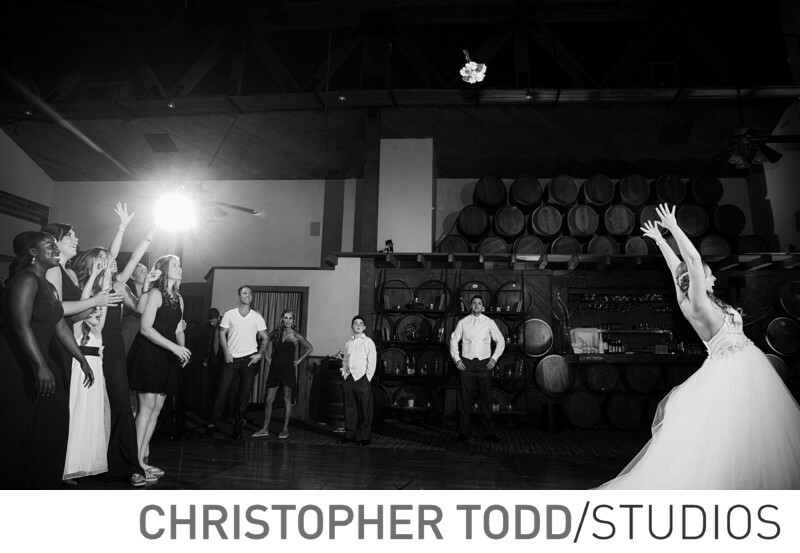 This black and white photograph of the bridal bouquet toss at Calamigos Ranchs' Redwood room takes stop action to the next level. Black-and-white elevates moment images like this into a more timeless category of photography. I love how the bride's bouquet is frozen in the top of the frame, with all eyes on the flowers. If you look close you can also see the excitement on the bride's face as she flung the bouquet over her shoulder. Luckily for the bride the Calamigos' Redwood Room at has high ceilings. This wedding venue is great for a rustic feel. This couple hailed from Oklahoma, and had elected to celebrate a destination wedding in Malibu. One of the best things about a destination wedding is the overall feeling of the celebration tends to be more carefree and relaxed, as wedding guests aren't thinking about work or chores, and tends to be more mindful or in the moment. Malibu is a popular destination wedding. Location: Santa Monica Mountains National Recreation Area, 327 Latigo Canyon Rd, Malibu, CA 90265. 1/80; f/3.5; ISO 640; 24.0 mm.